Having progressed to the second round of Chef Stagiaire, Emily spent a week stage at Michelin starred Arbutus in London. Here, she worked under Head Chef Tom Duffil as one of the team, preparing and creating dishes at this prestigious Soho restaurant. As well as staging at Arbutus, she also had to prepare and present the menu she submitted during the Paper Submission to be judged by the Head Chef himself. 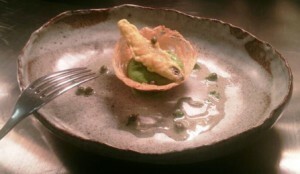 And here is what another dish looked like.